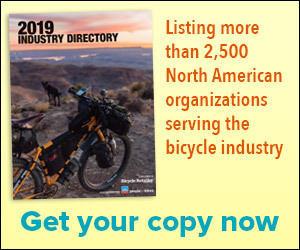 MILL VALLEY, Calif. (BRAIN) — Wilderness Trail Bikes plans to reshore some wheelbuilding next year to supply U.S. original equipment and aftermarket customers. The company plans to build wheels at its Novato, California, warehouse, using U.S.-made hubs and spokes and rims made in China. PARSIPPANY, N.J. (BRAIN) — Arnold Kamler, the CEO and chairman of Kent International, plans to testify in Washington this week against proposed tariffs and on behalf of Kent and a newly formed entity, the Reshoring Bicycle Production Team. WASHINGTON (BRAIN) — The subject was supposed to be the 25 percent tariffs the Trump administration wants to impose on virtually all bicycle products coming out of China. DAYTON, Ohio (BRAIN) — If the Trump administration is imposing tariffs on Chinese bikes in an effort to protect domestic bike manufacturing, Huffy's CEO says that ship has sailed. Trump administration's protectionist actions come "20 years too late," Bill Smith plans to tell the USTR. He also plans to speak out in defense of IBDs. ALLENTOWN, Pa. (BRAIN) — Former world champion cyclist Marty Nothstein said investigations for sexual misconduct stem from an anonymous "smear" that was sent to authorities soon after he announced he was running for U.S. Congress. WASHINGTON (BRAIN) — Industry members have been submitting comments to the U.S. Trade Representative opposing the Trump administration's proposed 25 percent tariff on $200 billion in Chinese products, which includes at least $1 billion in bike-related products. Representatives from Huffy, Specialized, QBP, ASE and Kent ask to speak at hearings on proposed 25 percent tariffs on a wide range of Chinese bike goods. FARMINGTON, Utah (BRAIN) — Vista Outdoor sales were down 6.6 percent in its most recent quarter and in an earnings call Thursday company executives gave some insights on their plans to sell off its Bell, Giro and Blackburn brands. Companywide sales were down 7 percent in recent quarter; executives discuss sell-off plans and potential impact of trade war. SANTA CRUZ, Calif. (BRAIN) — Ibis Cycles is now manufacturing size small Ripley LS carbon fiber mountain bike frames at its facility in Santa Cruz. The company said it has developed new carbon manufacturing techniques that reduce labor costs, making U.S. production more viable, and it hopes to bring more production back to the U.S. eventually.